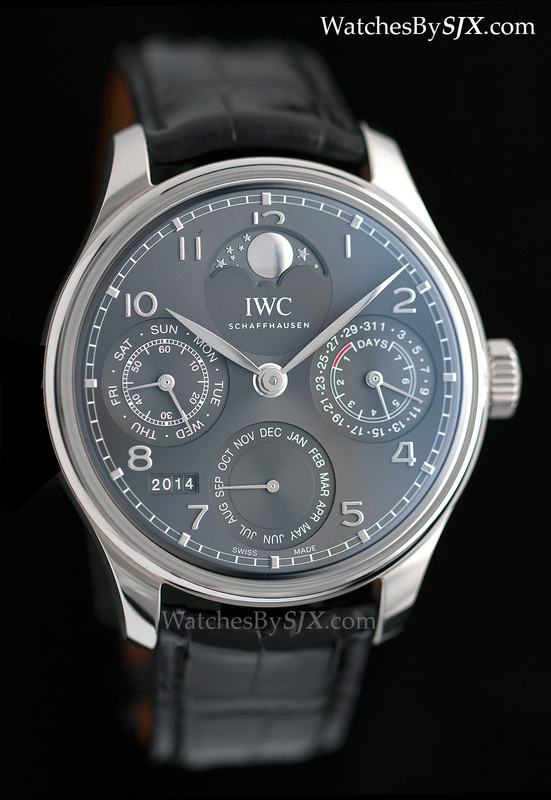 IWC revamped its bestselling Portugieser collection at SIHH 2015 in a manner traditionalists will welcome, keeping it safe, simple and classical. 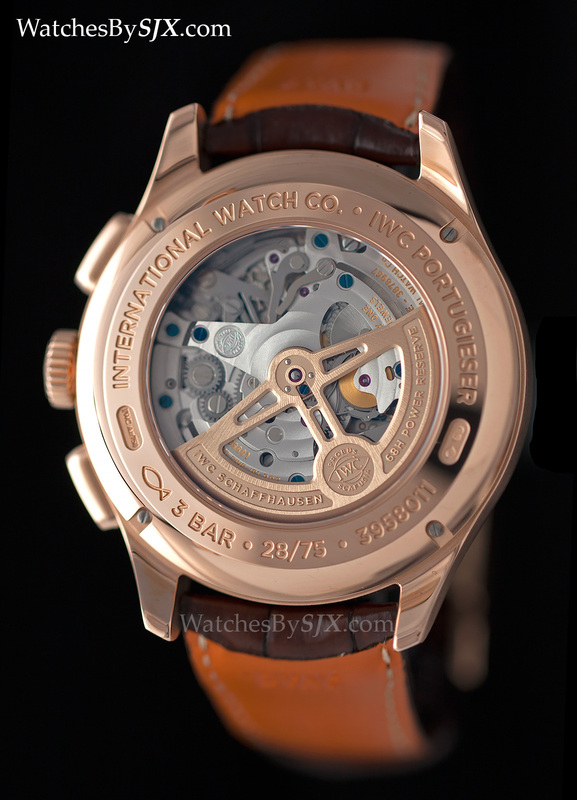 A new seven day power reserve caliber, the 52000, also made its debut. 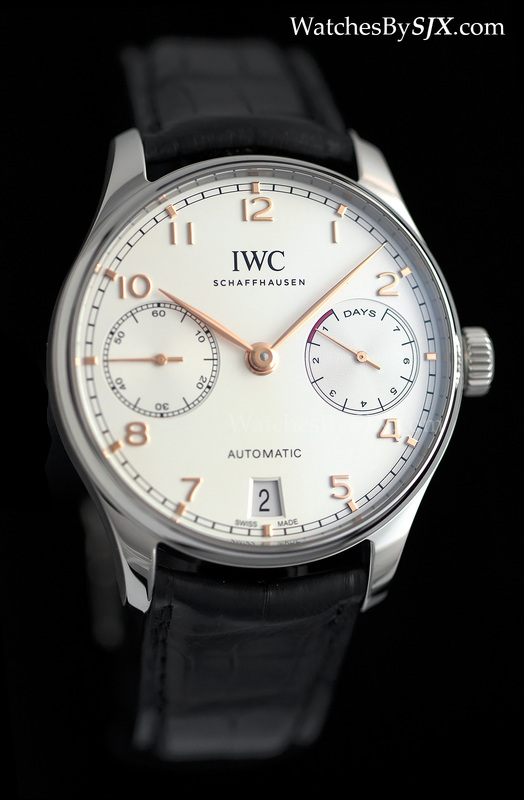 Now called the Portugieser, as IWC originally labelled the line (the brand is in the German part of Switzerland), the return to the former name encapsulates the direction of the new collection. 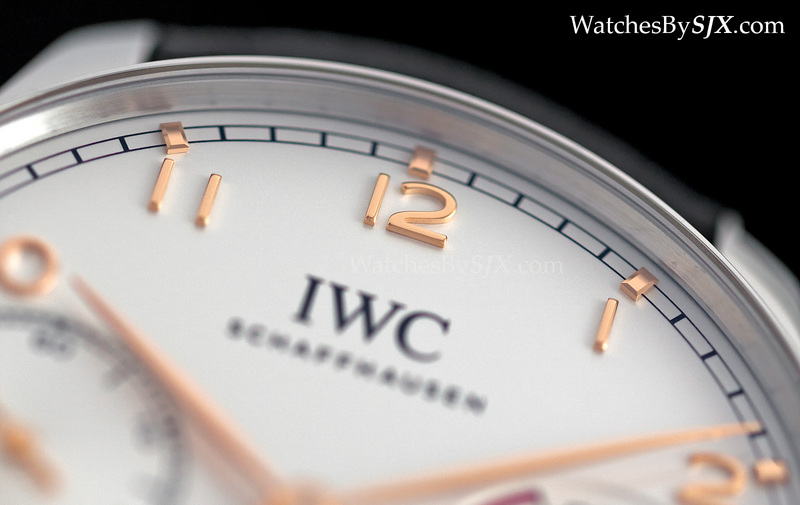 At SIHH 2015 IWC returned to basic principles, emphasising concise design and good engineering. 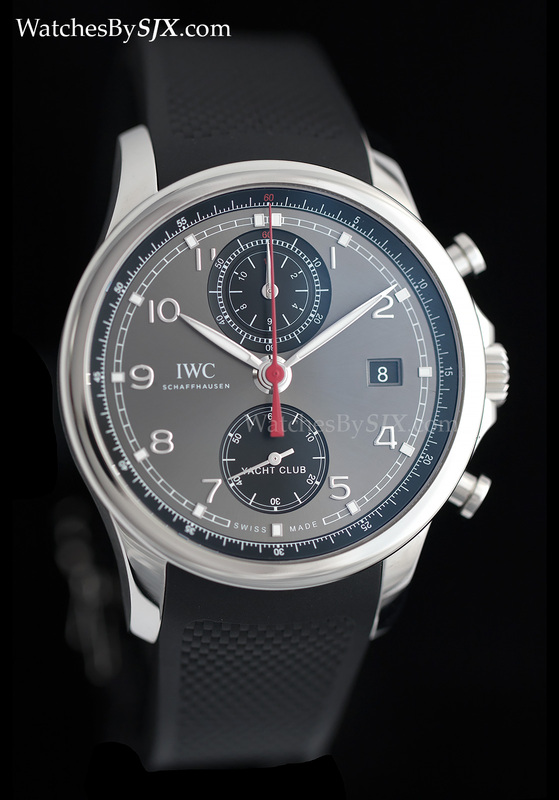 IWC plays it safe with the new Portuguese watches, which will please traditionalist fans of the brand, though notably the line-up lacks a lower priced, entry-level type watch that is fashionable now given the slowdown in the market. That, perhaps, might come later in the year. 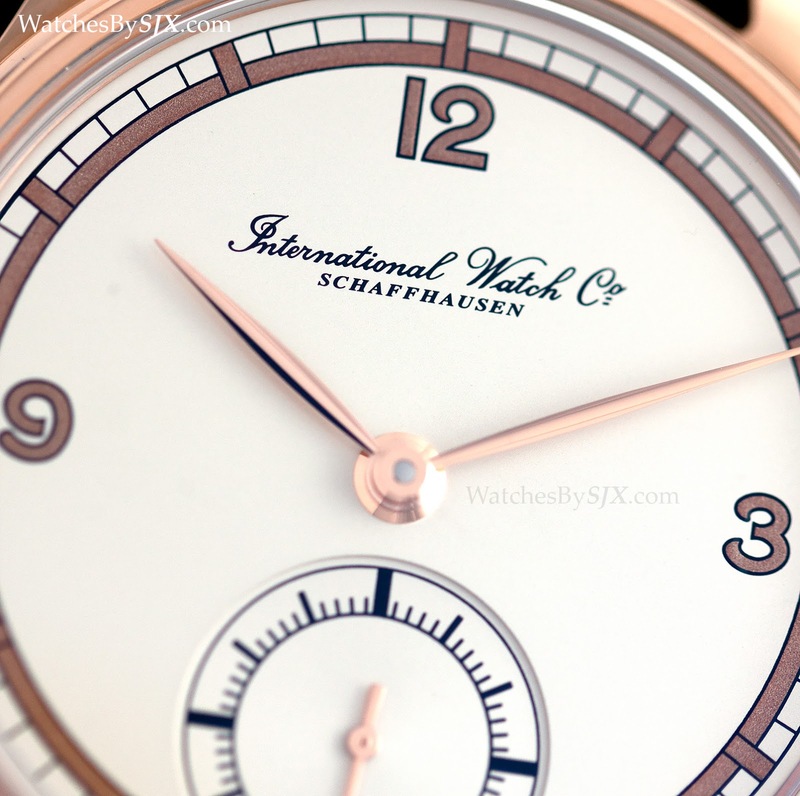 The watches have been tweaked and modernized, but all the key elements have been retained. 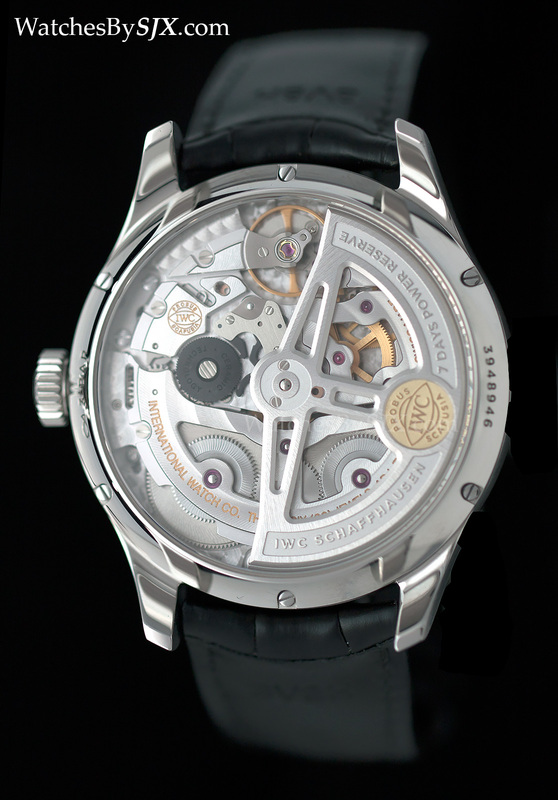 Upgrades like the new calibre 52000 movement and domed sapphire crystals are found on several models, but the archetypal Portugieser aesthetic is not diluted. 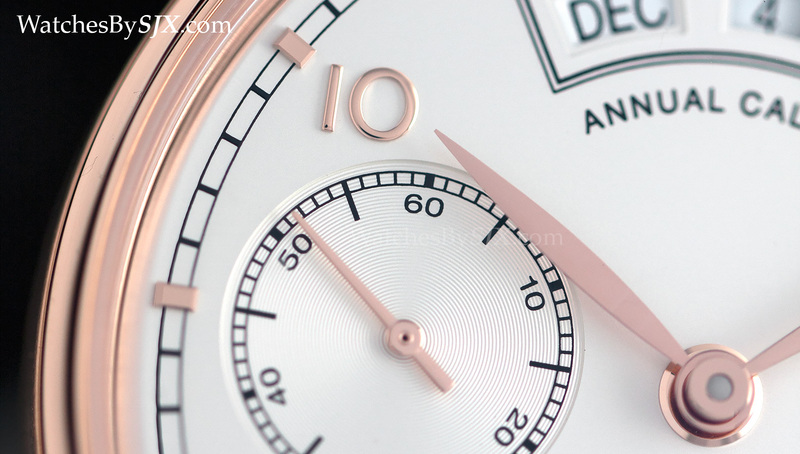 Several new watches were added to the Portuguese range, but all are facelifts of existing models, save for the Portugieser Annual Calendar and Perpetual Calendar Date-Month 75th Anniversary. [NB: All prices are in Singapore dollars (S$) and include 7% tax. 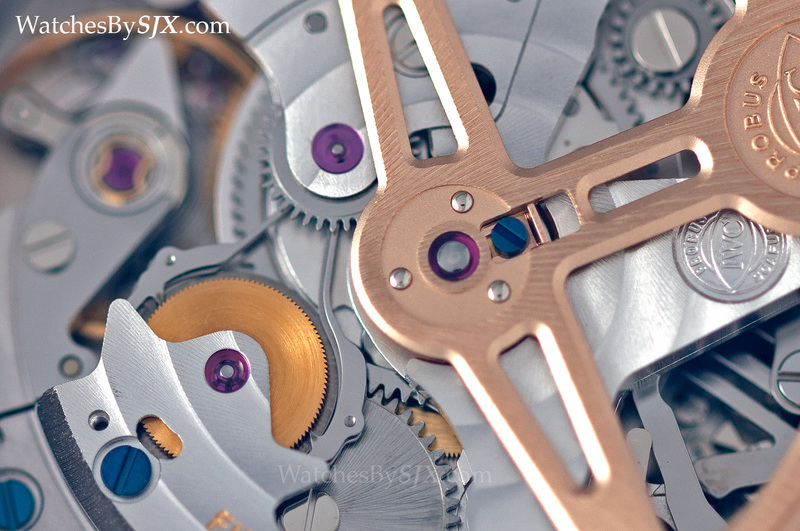 US$1=S$1.35] Most significant is the new calibre 52000 movement, shared by several models. This is meant to replace the admired calibre 5000. 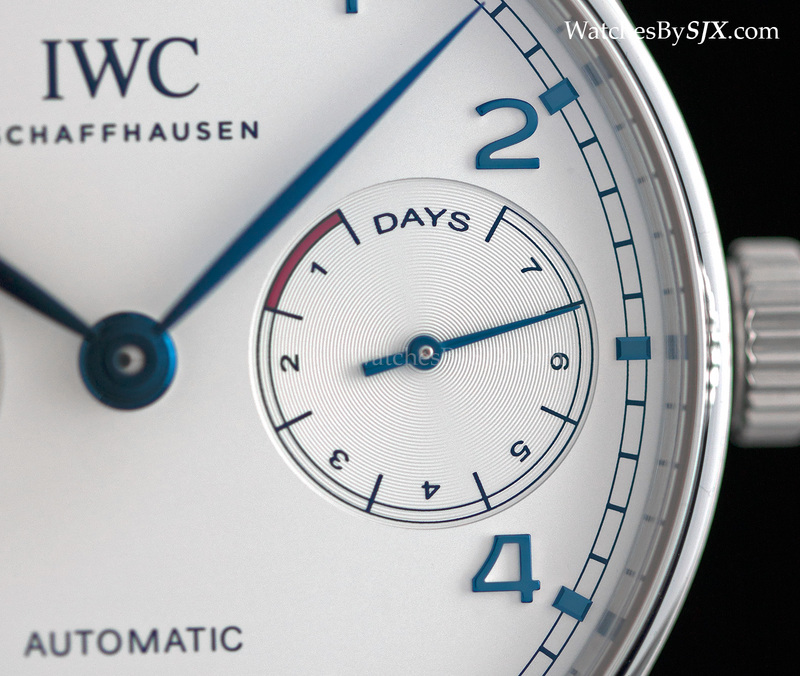 Functionally it is similar, with a seven day power reserve, Pellaton winding and free-sprung balance. But has been designed to show off a more decorative finish, including an open-worked rotor inlaid with a gold medallion and decorated with wide beveling (that’s cut by machine). 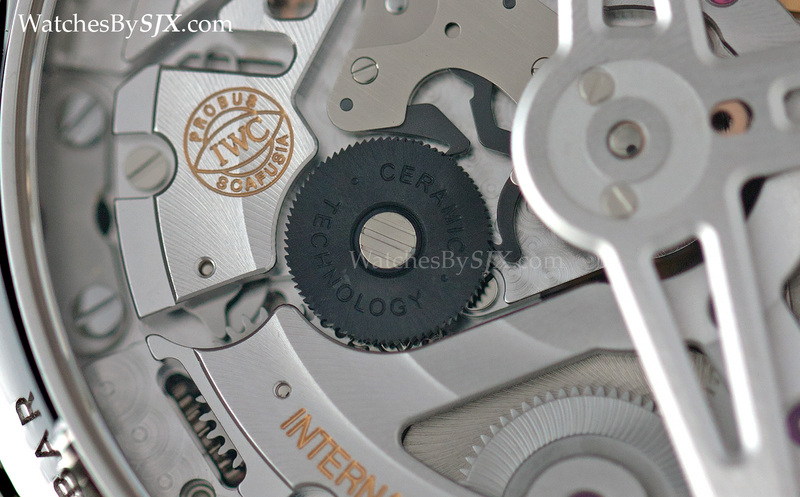 The calibre 52000 is also equipped with two barrels, as well as a winding wheels and pawls in ceramic. Overall it looks very much like a modern movement. 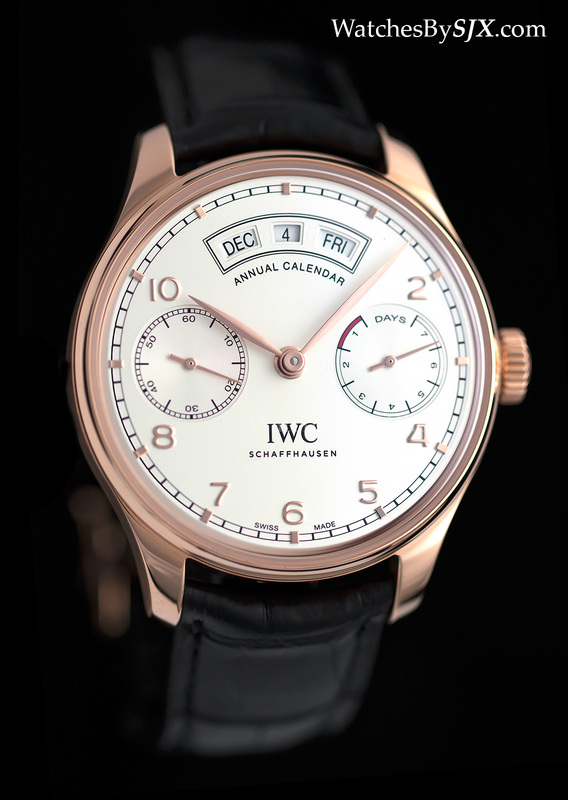 Previewed before SIHH 2015, the Portugieser Annual Calendar has an annual calendar display arranged in a semi-circle on the top of the dial. It’s functional and legible, though the box around the windows and text are unnecessary. 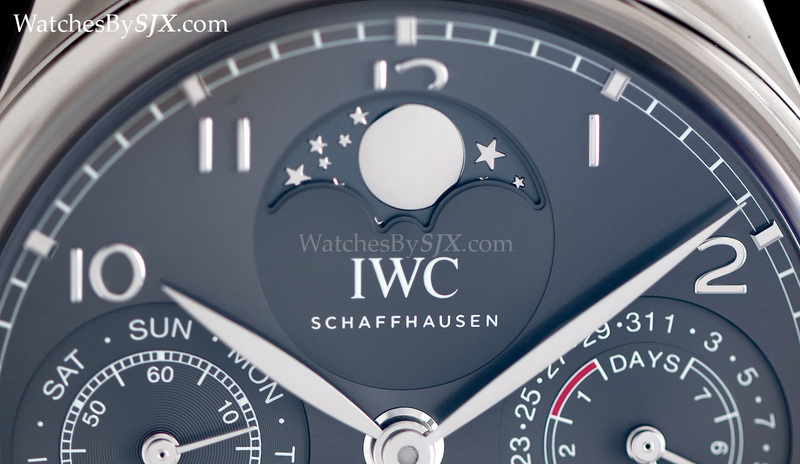 The case is 44.2 mm in diameter, the same as the perpetual calendar. 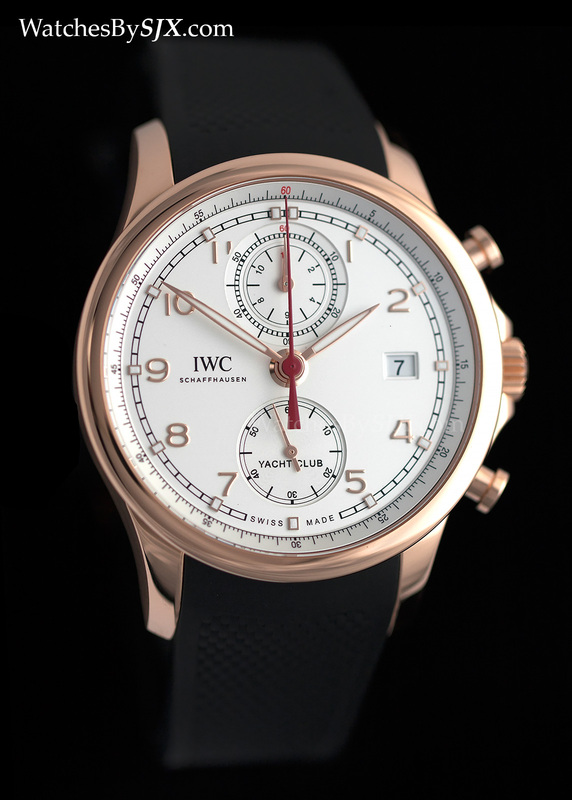 This is available in steel for S$32,900 or rose gold for S$48,700. 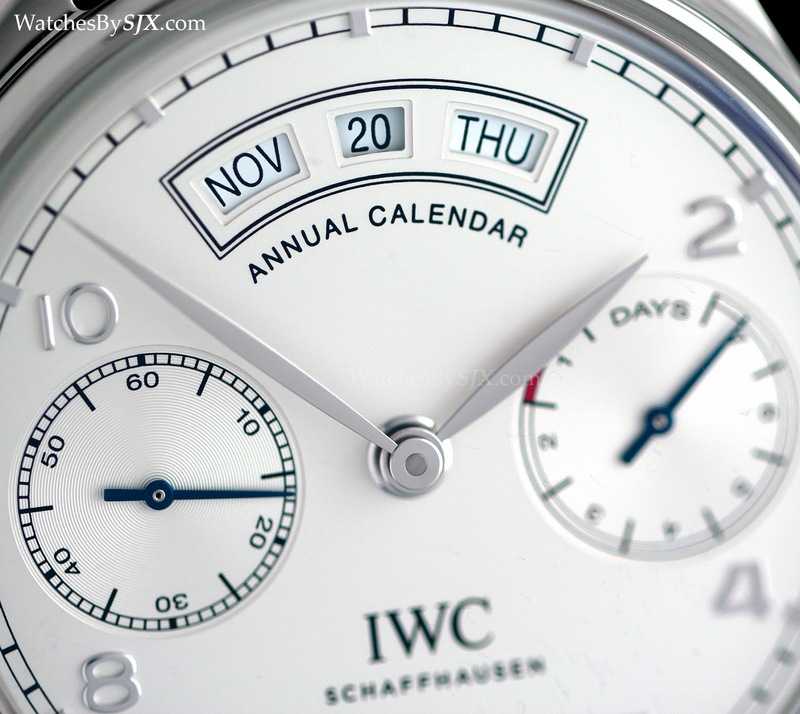 The annual calendar uses the new caliber 52850 movement, one of the caller 52000 family. 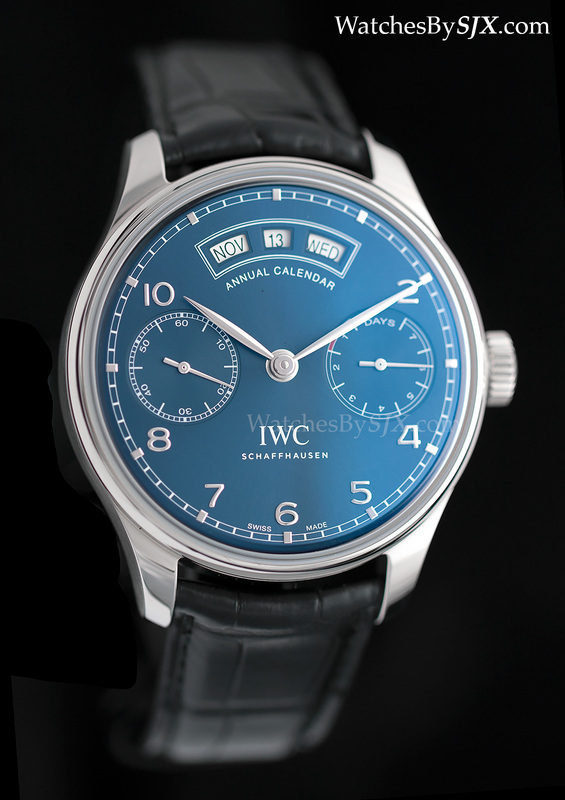 And the annual calendar also features a domed sapphire crystal, giving it a slightly vintage look. 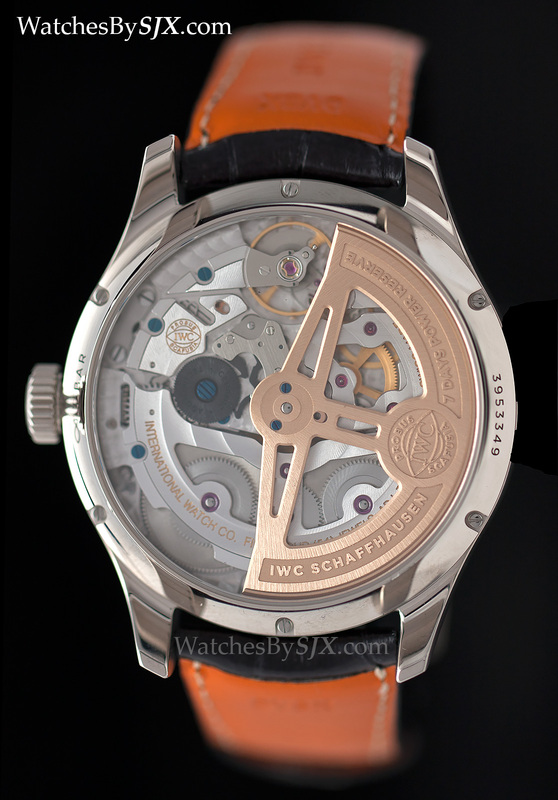 The same domed crystal and new movement is also found in the Portugieser Perpetual Calendar, which also uses the same 44.2 mm case. 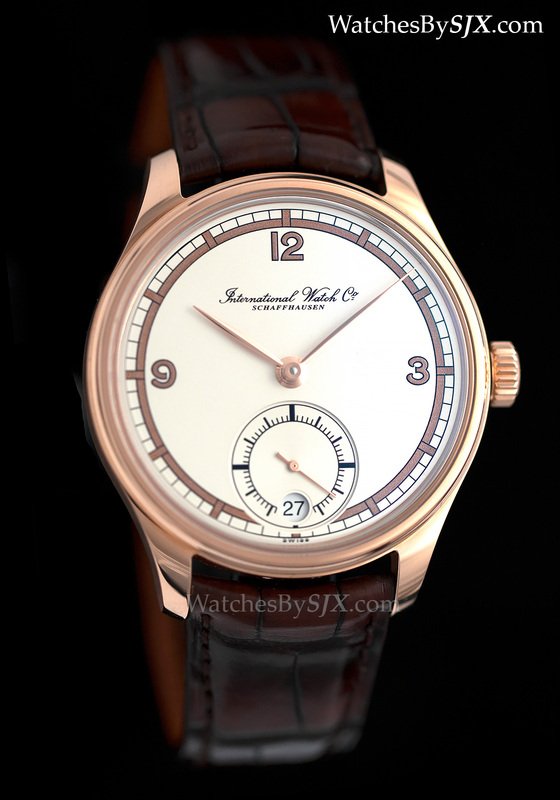 This is available only in gold for now, though the previous generation was available in steel as a limited edition, so there is hope for those wanting a more affordable version of this. 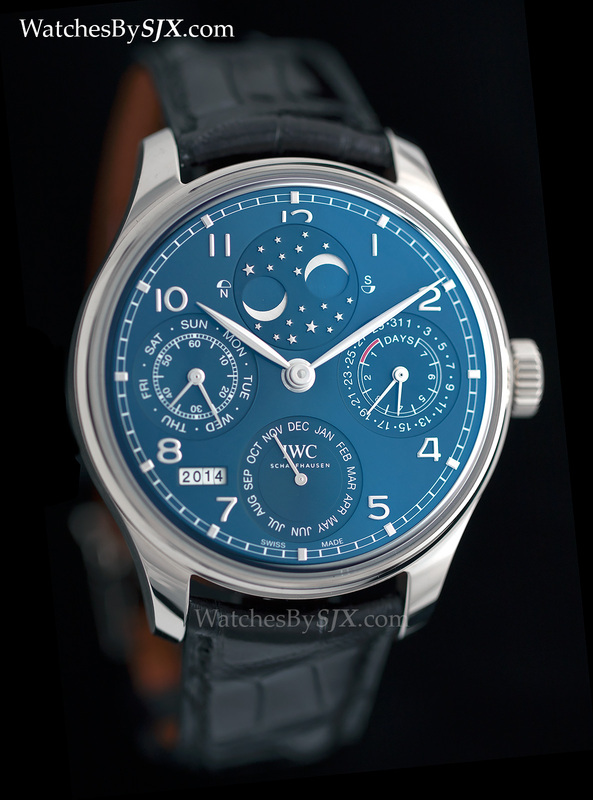 As before this is available with both the single and double moon phase, but all the dial versions now have a railroad minute track. The previous generation of perpetual calendars was somewhat confusing, with two case sizes and two dial styles. 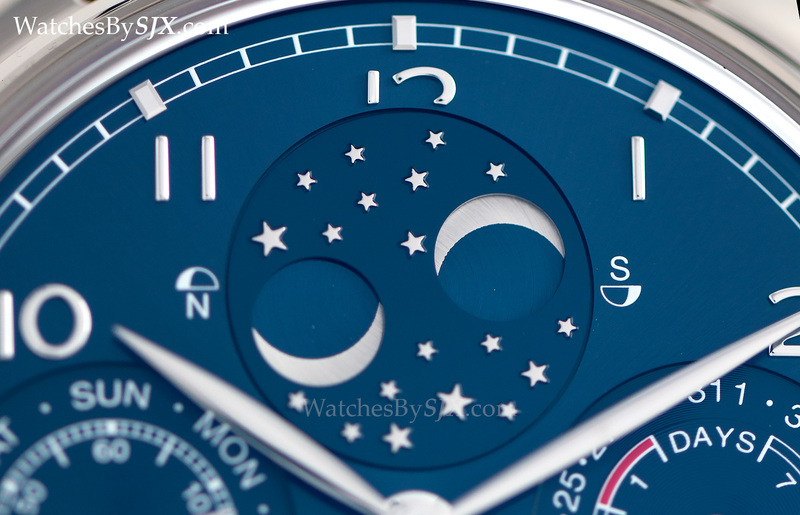 Now the dials are consistent, with the only difference being the moon phase display. 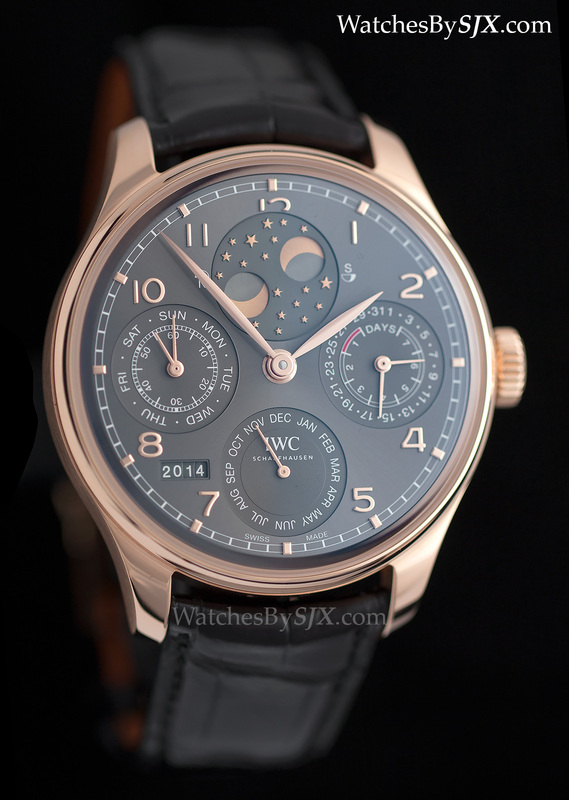 The single moon version costs S$58,700 in red gold and S$61,600 in white gold. 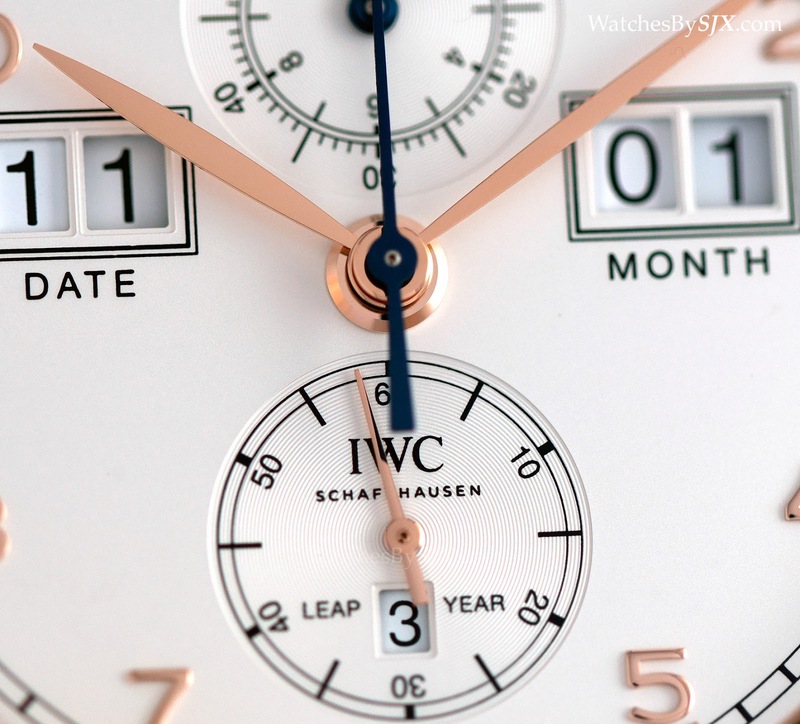 The double moon version costs marginally more, S$60,100 in red gold and S$63,000 in white gold. 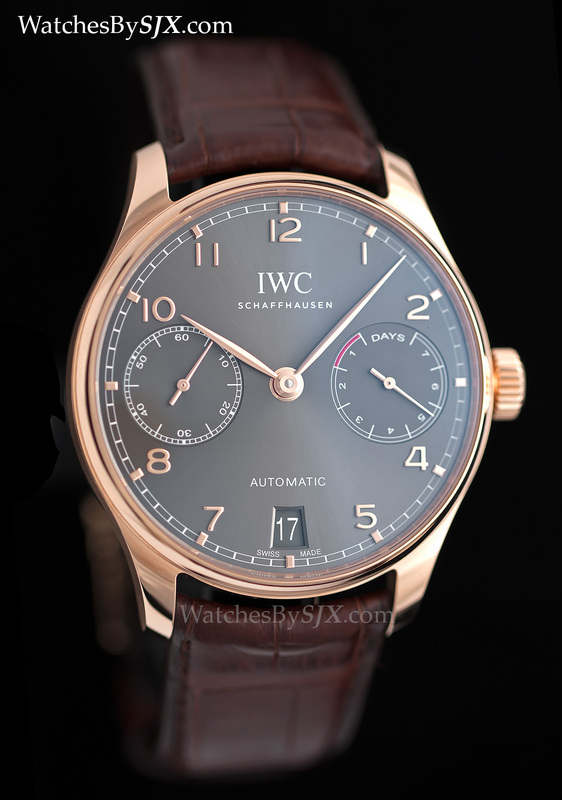 Also using the new movement is the Portugieser Automatic, one of IWC’s best loved watches. 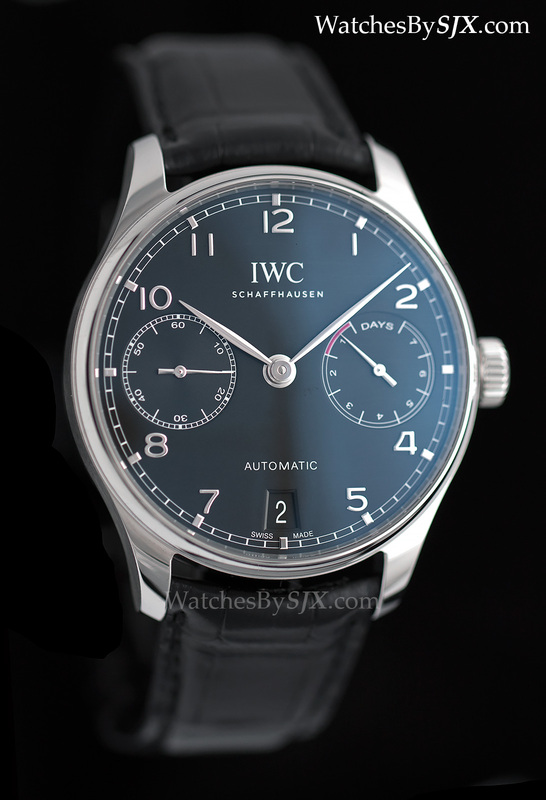 IWC has done well in keeping this much the same. 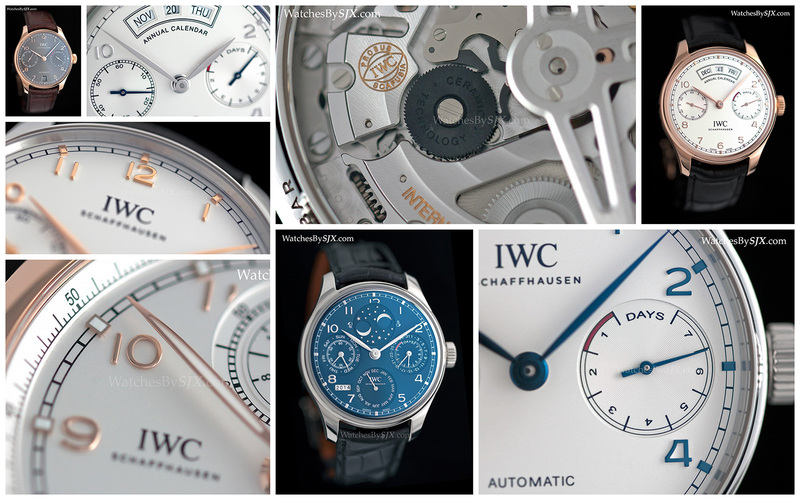 Visually these nearly identical to the outgoing models, with the primary change being the new calibre 52000 movement. 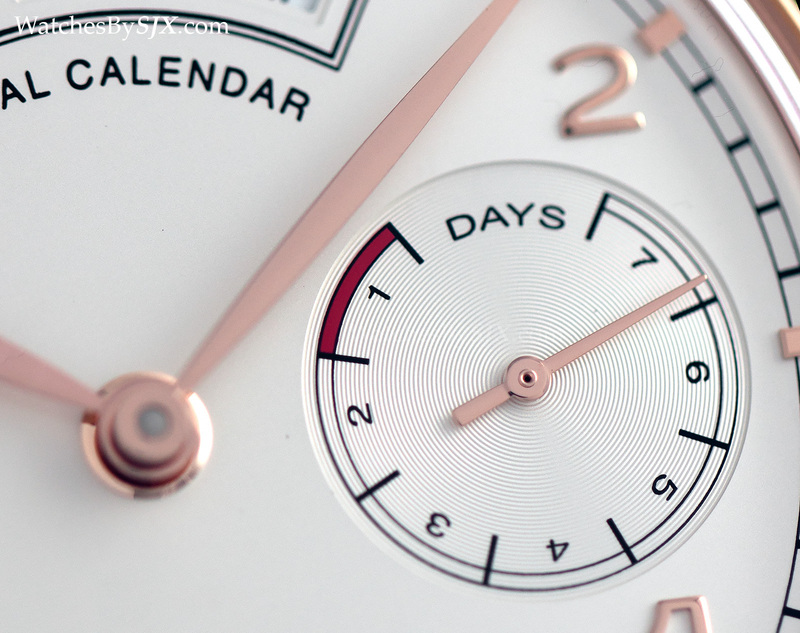 The case is the same size as before, at 42.3 mm. 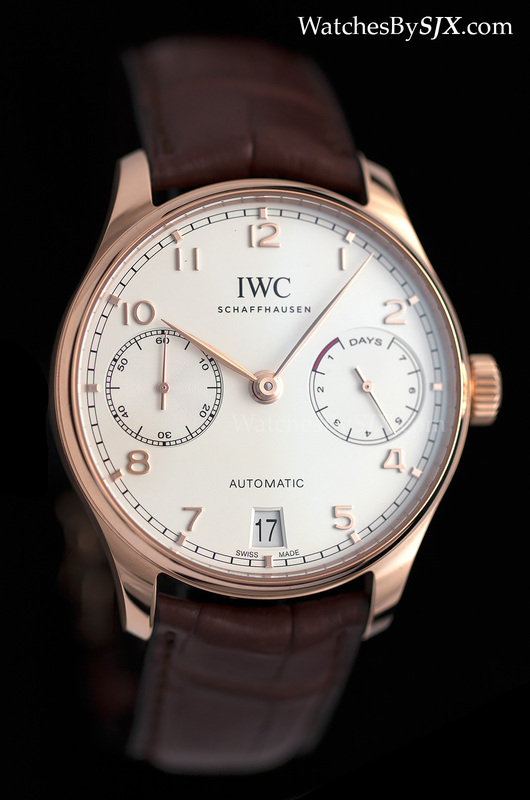 And it will cost exactly the same as the previous generation, at S$18,600 in steel and S$34,900 in red gold. 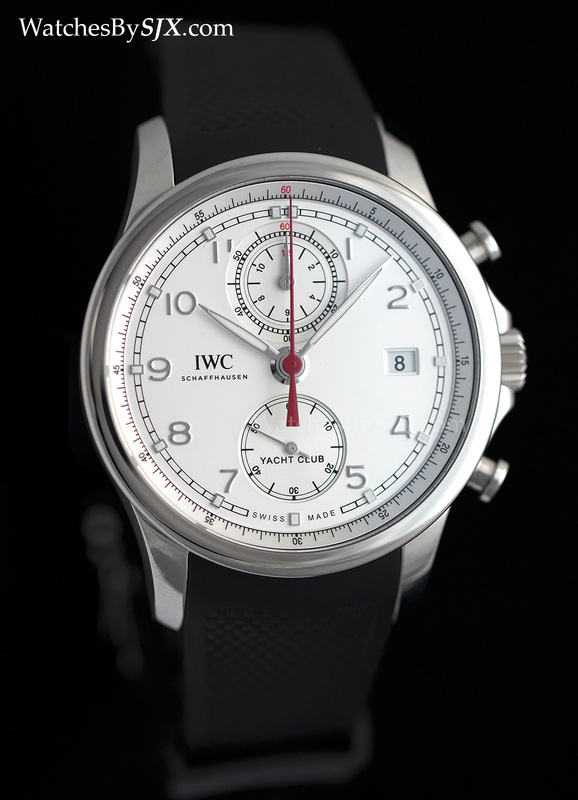 Looking much the same as before is the Portugieser Yacht Club Chronograph, except now in a smaller 43.5 mm case. Not immediately apparent in photos, the reduction in size gives it a more compact and refined feel in the metal. 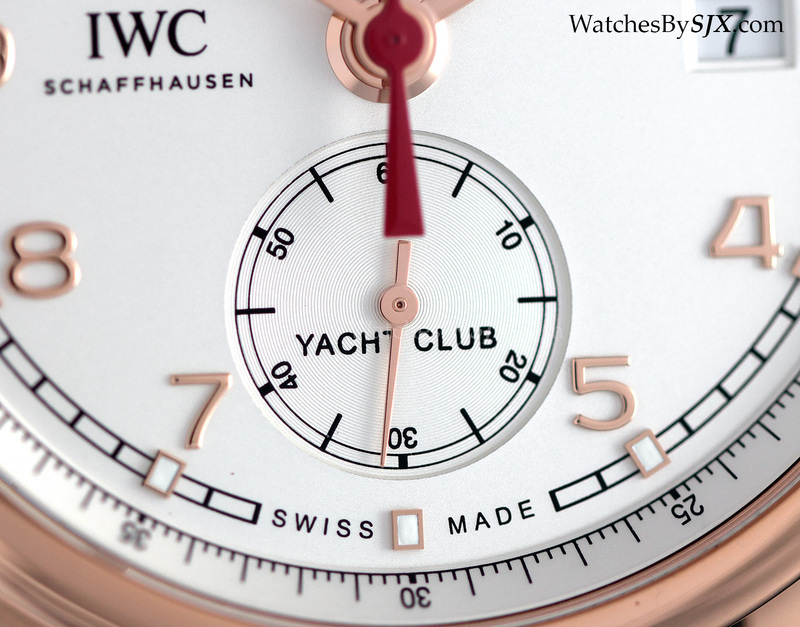 Before the Yacht Club was a chunky 45.4 mm in diameter. This costs S$18,100 in steel. 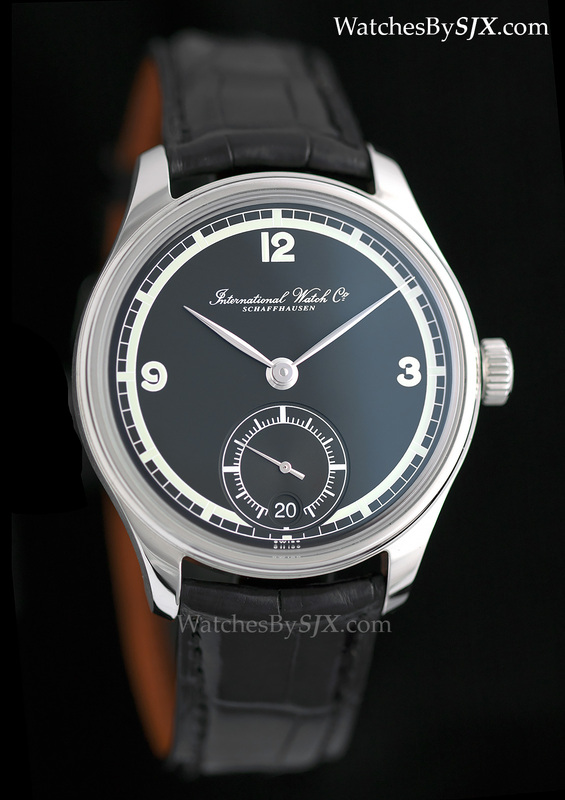 And the most unusual of the new Portugieser line-up is the Portugieser Hand-Wound Eight Days 75th Anniversary, modeled on a vintage Portuguese reference 325. 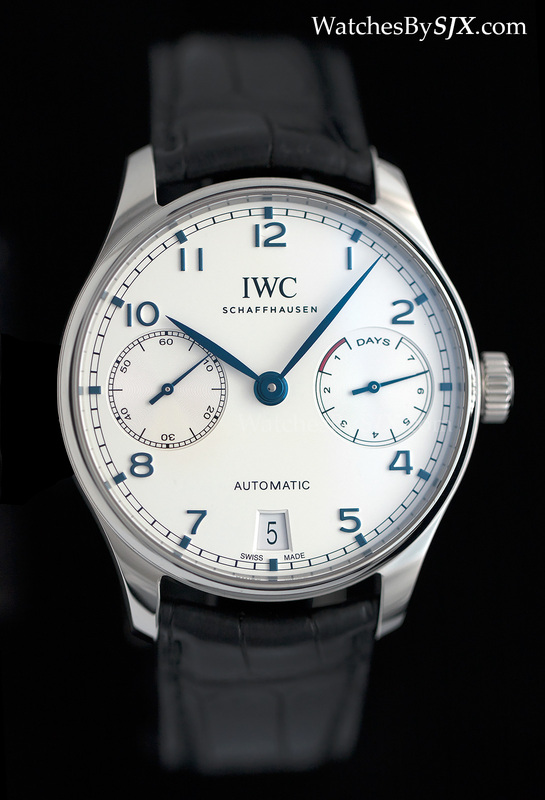 Though inspired by a vintage watch, this style is not one commonly seen today. It is a bold and adventurous design. 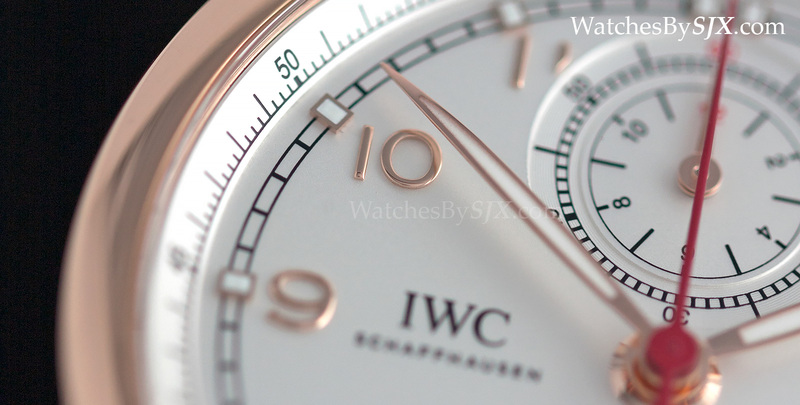 For more read my in-depth look at the watch. 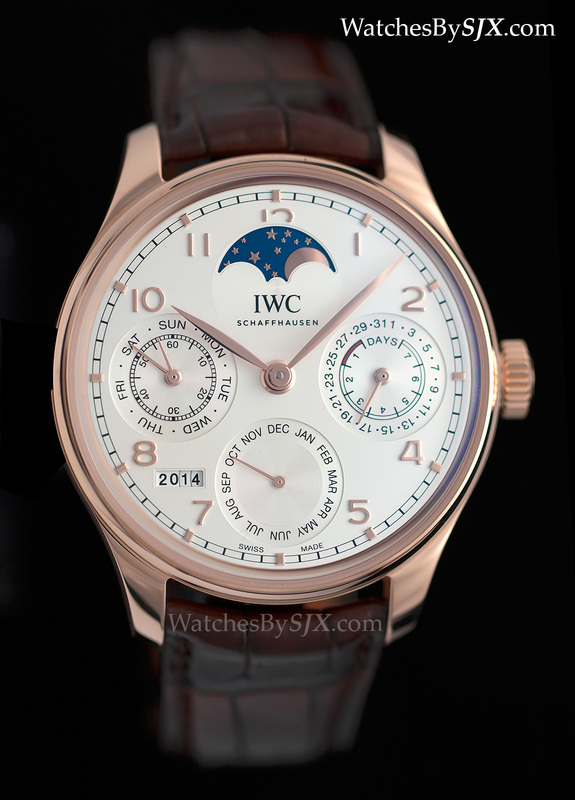 The other anniversary watch is the Portugieser Perpetual Calendar Digital Date-Month Edition “75th Anniversary”, a hulking, complicated timepiece. 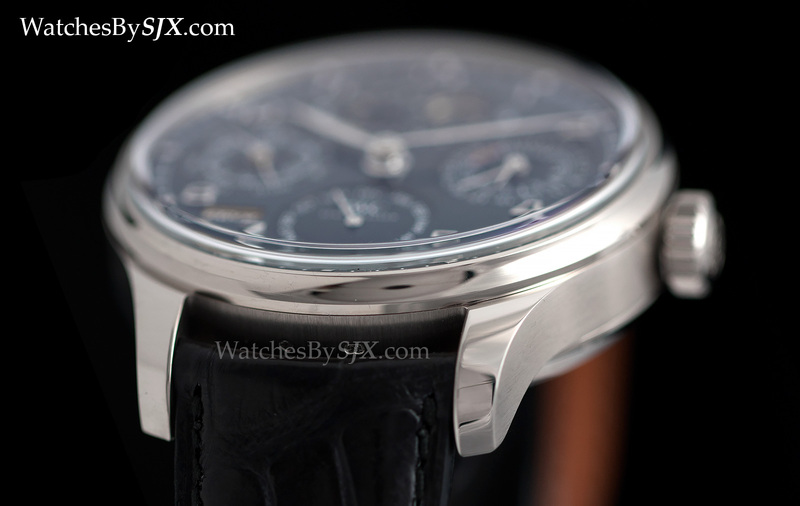 This has a 45 mm case, with a chronograph and perpetual calendar, with the date and month shown in large windows on the dial, throwing the dial off balance. 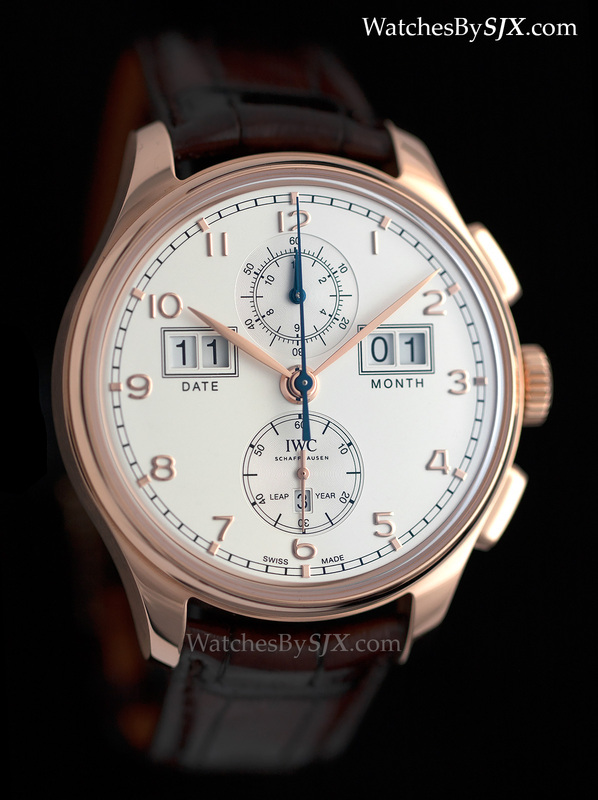 Available only in red gold, the perpetual calendar-chronograph is priced at S$70,200.